Improve emotion regulation with the legendary Incredible 5-Point Scale! 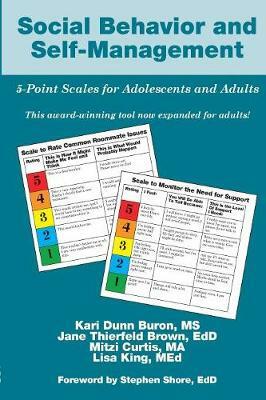 Building on the success on the legendary Incredible 5-Point Scale, Social Behavior and Self-Management: 5-Point Scales for Adolescents and Adults uses scales as a way of explaining social and emotional concepts to individuals who have difficulty understanding such information but have a relative strength in understanding systems. The 5-point scales can be used to increase communication between the person on the autism spectrum and their support person. The result? It can increase self-management skills and, once learned, it can serve as an excelled self-advocacy tool. Foreword by Stephen Shore, EdD. "As an ever-growing population of children on the autism spectrum ages up, so rises the urgent need to cultivate social competency across the lifespan. Expanding the use of the award-winning 5-Point Scale to support individuals in the adolescent and adult years is especially timely." -- Pamela Wolfberg, PhD, professor, Autism Spectrum Program "San Francisco State University"
"Social Behavior and Self Management: 5-Point Scales for Adolescents and Adults is a great resource. As a mentor and trainer, I have been recommending that and professionals use the 5-Point Scale with adults and young people alike. The scale is excellent because it is adaptable and simple and, therefor, versatile, quick, and effective..." -- Pamela Wolfberg "Amazon"
"This book will prove invaluable to families and professionals working with young adults seeking to make their way in the world independently. As an autistic person who grew up without any of this knowledge, I know firsthand what a difference it can make." -- John Elder Robinson "Amazon"
"Practical and easy to use, this volume provides a handy scaffold for self-monitoring and social interaction. Useful to individuals, parents, teachers, and other professionals, this valuable addition to the literature will be used for used for years to come." -- Fred R. Volkmar "Amazon"